BodgerMania, from Privateer Press, gets their turn to be reviewed over on Play Board Games. 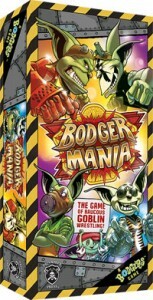 BodgerMania is a card game in which you play a goblin bodger that has decided to take up wrestling. You battle your opponents through three training rounds so you are ready to rumble when it is time for the main event.